If The Time Bum stands for anything, it is the prospect of a bargain. 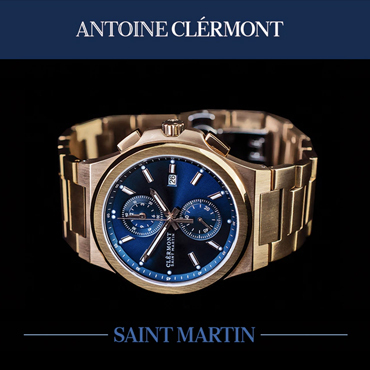 This does not always mean a dirt cheap price, but rather, getting a watch that has more to offer than its cost might suggest. 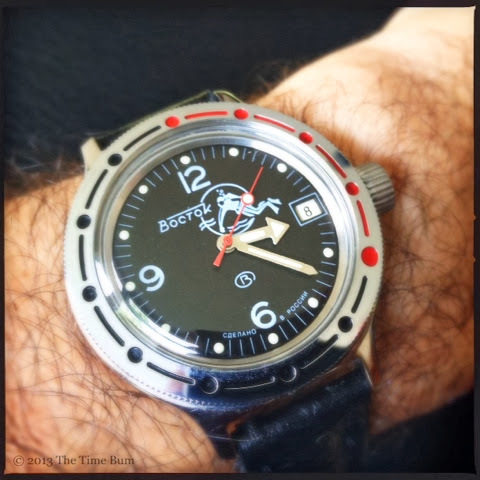 This eternal search for "more for less" led me to the Vostok Amphibia, a Russian work horse that enjoys a cult like following among a certain segment of watch nerds, and not just because you can buy them for about $70. There are plenty of cheap watches out there, but this is one of the special ones. Vostok traces its origins back to 1942 when the Moscow Watch Company evacuated to its current home in Chistopol City. 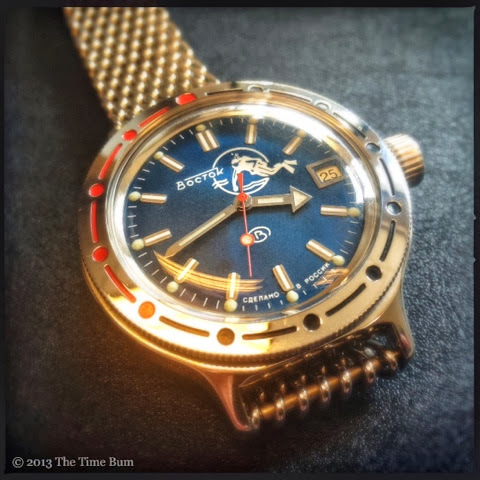 The Vostok name was adopted in honor of the Soviet space program in the 1960s, and the Amphibia arrived in 1968. It is driven by the venerable Vostok 2416b, a 31 jewel hand winding automatic movement, which is rather accurately described on the Chistopol City website as being "tougher than Russian steak." It has a power reserve of over 30 hours. 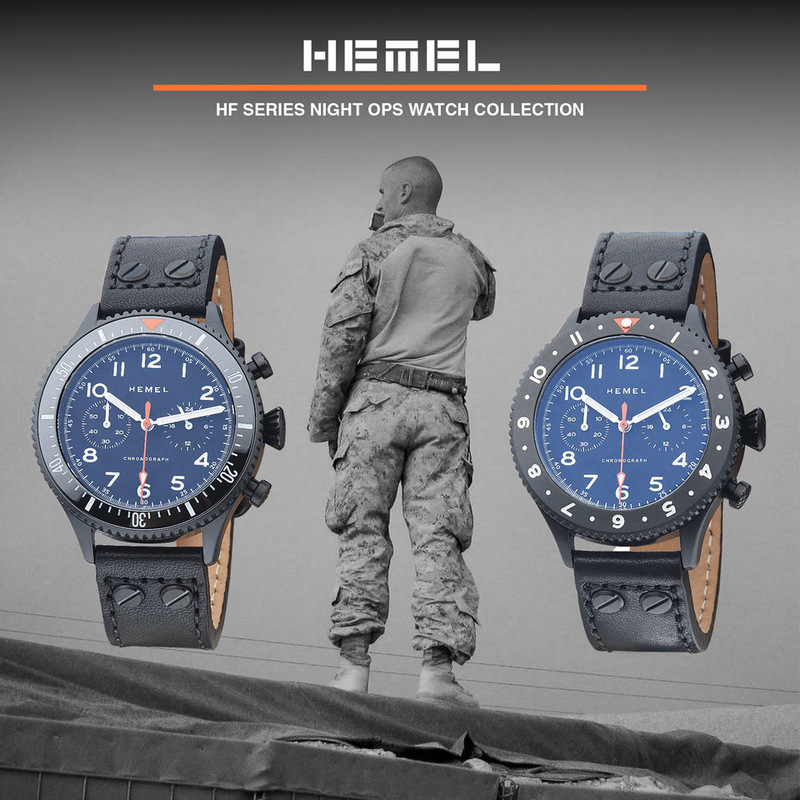 Water resistance is 200m and accomplished by a unique system incorporating a fat seal compressed by a bayonet style locking case back, which is secured by a threaded ring. This design allows for a high degree of water resistance while permitting lower production tolerances than would be necessary for a threaded case back. 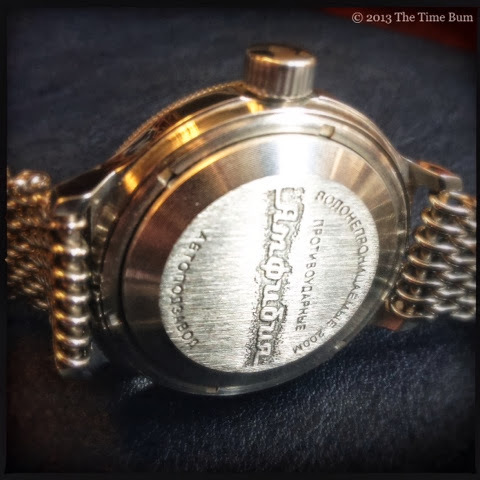 At higher pressure, the case back is actually pressed tighter against the seal, increasing water resistance as the watch is submerged to greater depth. It is a brilliant solution. For more background and mechanical detail, see these excellent articles from Hodinkee and Watchuseek. While tough and utilitarian, Amphibias are by no means Spartan. 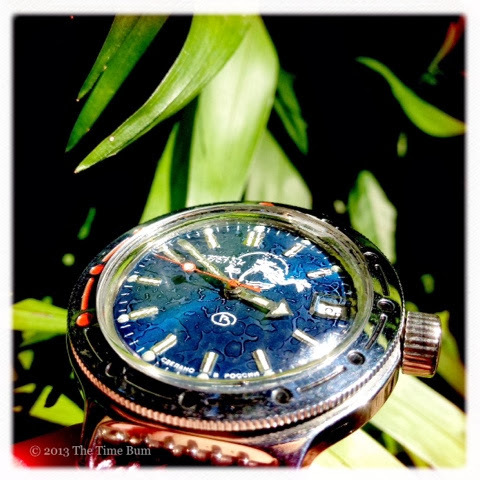 Vostok offers more variety in dials than Baskin Robbins has ice cream. Numerous colors, designs, and commemorative editions have been produced, most with a date window at 3:00 or 6:00. 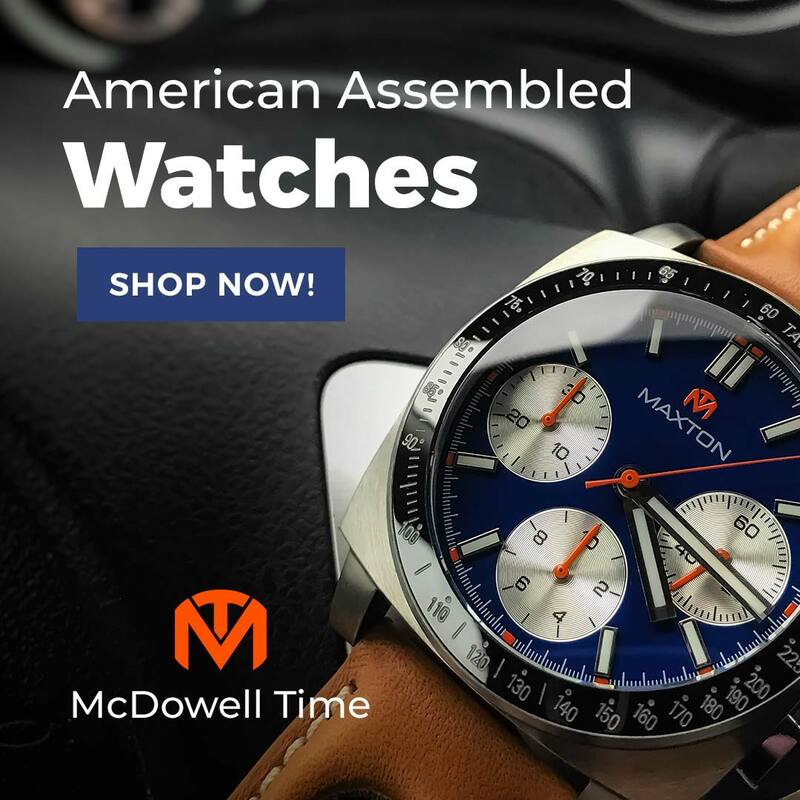 There are several different cases available, but all are stainless steel and approximately 40mm, however, with a small dial and simple chrome bezel, the watches tend to appear even smaller on the wrist. They sport one of three bidirectional, plated brass bezels. A screw down crown is located at 3:00. As one might expect, the price is achieved with some compromise, but not much. Illumination is theoretical at best. Eventually, the plated bezel will wear. The action on the crown seems somewhat wobbly, but this is a design feature, not a flaw. The crystal is domed acrylic and prone to scratch, but just as easily polished. I have been amazed at the damage I have rubbed out of acrylic. To me, the worst feature is the lack of a quick set date. You must wind the watch from 8:00, past 12:00 and back to advance the wheel without going around the dial. It works, but it is a pain. For my own Amphibia, I chose the popular "Scuba Dude" design, featuring a frogman in the upper right quadrant of the dial. I also chose the round model 420 case with a dive bezel and 18mm lugs. Unable to decide between a black dial or blue dial, I got one of each. Both dials have a 3:00 date window and a printed seconds track with lume dots at the hours. Hour and minute hands are polished and lume filled, the lollypop second hand is red. 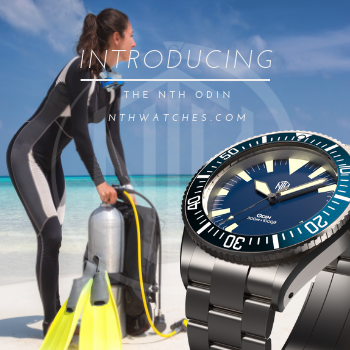 The black dial has a grey frogman and Arabic numerals printed at 12, 6, and 9 while the blue dial features a white frogman with applied polished and white bar hour markers with a double bar at 12:00. Amphibias are available with steel bracelets, which are neither terribly attractive nor comfortable. My blue dial had black croc embossed leather strap with blue stitching, and the black dial came on black rubber, but frankly, these did nothing for me either and were quickly replaced. While I was changing things up, I decided to take the two watches in different directions. The blue dial is the prettier of the two watches. The color is vibrant with a subtle sun ray effect, and with its polished case, bezel and markers, I found it looked best on a polished shark mesh bracelet from StrapCode, which at $84 cost more than the watch. The black dial is more sober with its grey printed markers, so I paired it with a grey and black striped Crown & Buckle NATO for $12. Not content with a simple strap change, I decided to modify the bezel as well. 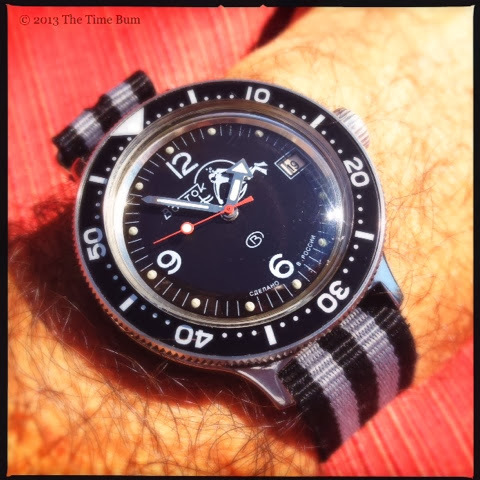 Swapping bezels on an Amphibia is almost as easy as swapping straps. Just protect the case with some plastic wrap and pry it off with a case knife or pen knife. Tension is maintained by a circular spring that is refitted to the new bezel before you press it back into place. Rather than choose a Vostok bezel, I fitted a machined stainless steel one from Murphy Manufacturing. Murphy offers different styles of bezel for both the Amphibia and the Seiko SKX007/009 for $40 each. I chose one that accepted a standard Seiko 007 bezel insert from Dagaz Watch for $20. Again, the cost of my modifications exceeded the cost of the watch, but the result was well worth it. The black numeric bezel is more useful than the factory dots-and-dashes and has the effect of making the dial, and thus the watch, appear larger. The Amphibia is a treat. It is a legitimate 200m diver for an amazingly low price. It is tough as nails. It is available in wide variety of colors, designs, cases, and bezels to suit your taste. If that is not enough, you can get aftermarket bezels and inserts as well. The Scuba Dude is the watch I most often take on vacation because it looks cool and can take anything I throw at it. For $70 shipped from Russia, I'd call that a bargain. Pro: Reliable movement, incredible variety, brilliant engineering. Con: Poor lume and bracelet, not-so-quick-set date. Sum: "The Dude abides. I don't know 'bout you, but I take comfort in that. Knowin' he's out there takin' 'er easy for all us sinners."